Swarming with people during holidays, Hlavne Namestie serves as the city's center and social hub, a square lined with former palaces featuring a number of architectural styles, from Romanesque to Art Nouveau, including the old town hall. Shop for souvenirs at the souvenir market or get a bite to eat at one of the many hotels, restaurants, and cafes. The square is home to the 16th-century Roland Fountain and many unusual modern sculptures. Some are lurking from corners and emerging from holes in the ground, while others strike poses, such as the statue of the Napoleonic soldier leaning against a bench. The square is also ideal for people-watching or catching some street entertainment. Plan to visit Hlavne Namestie during your Bratislava vacation using our convenient Bratislava trip itinerary builder tool . The main square, it is called because home. There are fairs, folk festivals. In this area a lot of souvenir shops, fountain, various shops. A very small area. Look at the square in the morning and in the afternoon very different. Early in the morning on one of the benches that stand on the square, a beggar sleeping kind of guy in the complete absence of people. But the day is not very crowded by tourists, most of them Chinese tourists. During this visit in Bratislava, is not found in the main square shape Napoleonic soldier who was standing leaning on one of the benches. We hope that this monument is simply taken away for restoration. Information found on this subject. The Centre of the old town is kept clean, pure and simple. It is also wonderfully calm. Miss can be ranked in any case. Travel Tip: During a day trip by train from Vienna, it runs from central station to the Slavin 20 minutes - there are lots of stairs. Then it goes from there another 20 minutes to the Castle. Then we go in approx. 20 minutes to the blue Church. You can spend the noon/afternoon then wonderful old town before it again goes back on the night train to Vienna. A small public square housing the roland fountain, the old town hall and other historical landmarks. Many restaurants and kiosks in the vicinity and is pretty much always flocking with tourists and localiites. The square has many faces starting from busy tourist season calming down in the winter evenings. 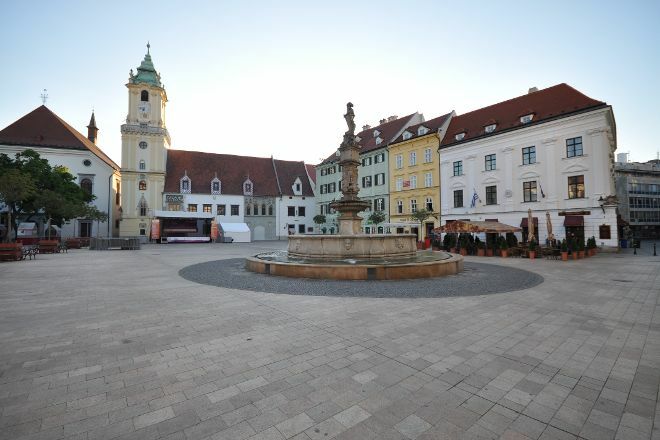 It is most historic Square in Bratislava. Best time to visit it goodbye Sunday early morning for quiet and relaxing moments , or during the Christmas markets. Probably most photogenic times are afternoon and early evening when sunlight Shines on the rathaus. Square is also probably a favorite place of current Dalai Lama who used to visit it and relax here during his private visits to Bratislava. Peaceful in beautiful. There's a red minibus on the square. You must take it. You can go on a tour of old part of town for only 10 EUR. And they have also audioguide in 17 languages. For all the city only 20 Eur. Also the dirven was nice and he shows you the monuments. Such a charming square in the city. It definitely gives you the European vibe. Nice place to wonder about. Every day, we help thousands of travelers plan great vacations. Here are some tips on how to use your Listing Page to attract more travelers to your business - Hlavne Namestie. Promote your permanent link - https://www.inspirock.com/slovakia/bratislava/hlavne-namestie-a110499971 - on your website, your blog, and social media. When a traveler builds a plan from this page, the itinerary automatically includes Hlavne Namestie. This is a great way for travelers looking for a great vacation in your city or country to also experience Hlavne Namestie. Promoting your link also lets your audience know that you are featured on a rapidly growing travel site. In addition, the more this page is used, the more we will promote Hlavne Namestie to other Inspirock users. For best results, use the customized Trip Planning Widget for Hlavne Namestie on your website. It has all the advantages mentioned above, plus users to your site can conveniently access it directly on your site. Visitors to your site will appreciate you offering them help with planning their vacation. Setting this up takes just a few minutes - Click here for instructions.